Internship at NASA JPL - My rendezvous with Mars Rovers! 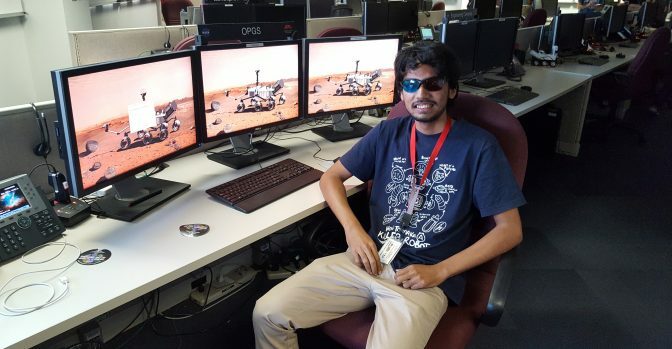 About the Author: Sourish Ghosh, a student of IIT Kharagpur, talks about his struggle to land an internship at NASA and the events that followed. During my correspondence with JPL, I had rejected the internship offers from other institutes like Max Planck Cybernetics. I was devastated! I couldn’t concentrate on anything and cried endlessly, so my parents offered to pay for my stay in California. Self-funded internships, however, were not possible. Another option was to secure funding from a third party organisation, like government, college, etc. and participate in the JPL Visiting Scholar Research Program (JVSRP). Again, this was really difficult! The last possibility was to contact a Caltech professor and apply for a SURF project which had a collaboration with JPL. Only twenty days were left for applying to SURF and most professors would have chosen interns by then. The aforementioned professor recommended me to two Caltech professors. This accelerated the process and one of them asked me to draft my SURF proposal. The SURF application involved an application form regarding my personal details, a project proposal, 3 confidential letters of recommendation, and an unofficial transcript. I completed my application and drafted a proposal outlining my project details and how I planned to complete the project during the 10-week timeframe. I checked each and every detail and took care of even the most minor bits like commas. The results were to be announced a month later. I was filled with anxiety even though my mentor assured me of my chances to get through it. The probability held good and I got the confirmation for selection. I let out a sigh of relief! SURF/JVSRP was a 10-week internship program during which I worked on risk-aware probabilistic motion planning for future Mars Rovers which aimed to reduce the conservatism of the present autonomous navigator of the Mars 2020 Rover. In layman terms, I developed a new algorithm that would increase the efficiency of autonomous navigation for Mars Rovers. During that summer, JPL had around 900 interns because of the Europa and Mars 2020 missions. I was an intern at the Robotic Systems Estimation, Decision, and Control Group (347-E). I used to test my algorithms on the Athena Rover which is a small-scale testbed Mars Rover. We used to carry out the testing at the Mars Yard, which is a very touristy spot at JPL. I felt very privileged to be able to contribute to the huge code repositories which have been maintained for more than 10 years by people seasoned in robotics. JPL had an unusual charm and places like mission control centers at Space Flight Operations Facility amused me. Working with the pioneers of space exploration was like a dream come true! If the Jedi were real, they would be at JPL! May the force be with them forever. During my stay, I traveled a lot around the beautiful cities of Pasadena and Los Angeles. We had every alternate Fridays off-work, so we’d hit Old Town Pasadena for drinks, go bar hopping, and explore major tourist attractions like Hollywood sign, Universal Studios, Santa Monica, and Malibu. I also visited the California Science Centre where the space shuttle endeavor is displayed. I traveled to the east coast and went to UMass for a week and saw fireworks in New York on July 4 and of course, the breathtaking Manhattan skyline! Ever wondered about working at NASA? Apply to these programming internships and begin your journey.